Here is a thread for telling us about personal encounters with Douglas Adams. Maybe you knew him, maybe you met him, maybe you stalked him, whatever, just tell us about it. Include photos if you have any. 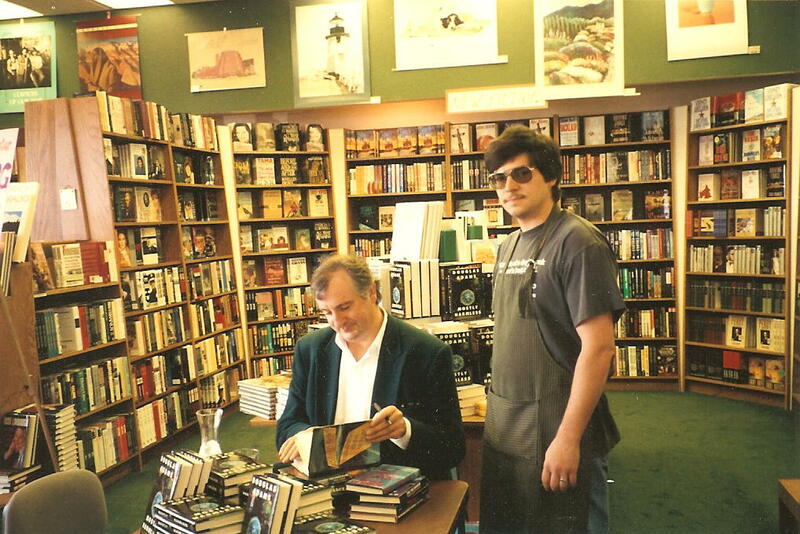 Back in the early 90s (1992 maybe), I worked in a bookstore and we had Douglas Adams in for a book signing. Before the signing he spent most of his time browsing our computer book section (one of the largest selections he had ever seen). In conversation it was clear that this was his passion. We talked about a variety of things; Last Chance to See being his favorite among his works, the difficulties of writing humor, how his next book was going to be a Dirk Gently book - but whenever the subject turned to computers, his enthusiasm was noticeably higher. Since I was the computer book buyer for the store, I was able to give recommendations in the subjects he was interested in. I kept wanting to ask him about his writing and he kept wanting to talk about computers. Man, you look calm. I could hardly hold it together when I met Jannell Cannon, the author of the kids book, Stellaluna.